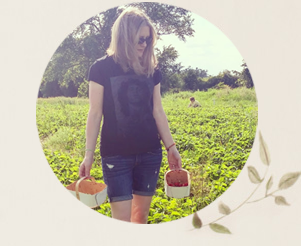 When I wrote about how I store all of my thrifted and inherited dishes about a month ago, it really made me think twice about doing any more thrift store shopping. How many dishes can one family use, after all? This past weekend, I once again visited the small town near my parents' home ("the cottage"). I couldn't resist checking out the local thrift shop, which has all sorts of amazing vintage dishes. But I was strong. I decided anything I bought would have to be useful in some way, and I only bought two small things. 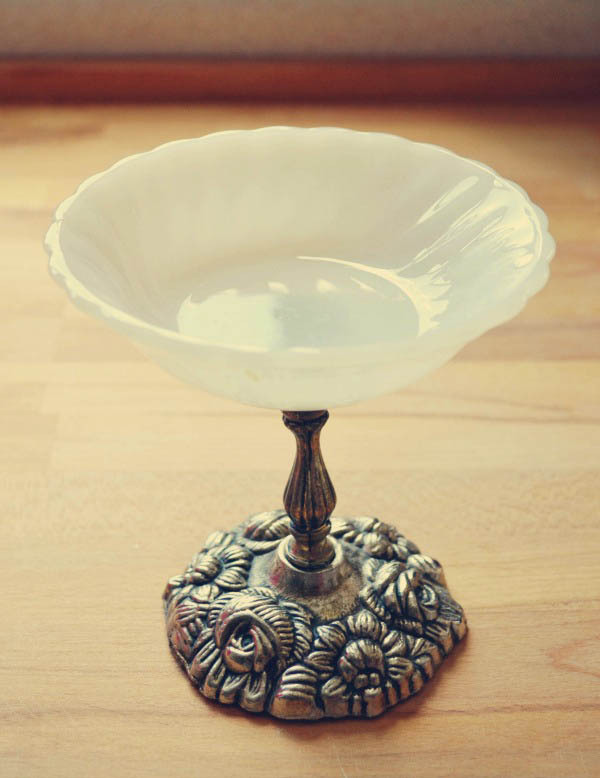 I plan to use this pretty dish, above, to hold soap in our master bathroom. It would also make a nice candy dish but candy wouldn't last long out in the open around here. It cost me $2. This happy whale has a clear use. 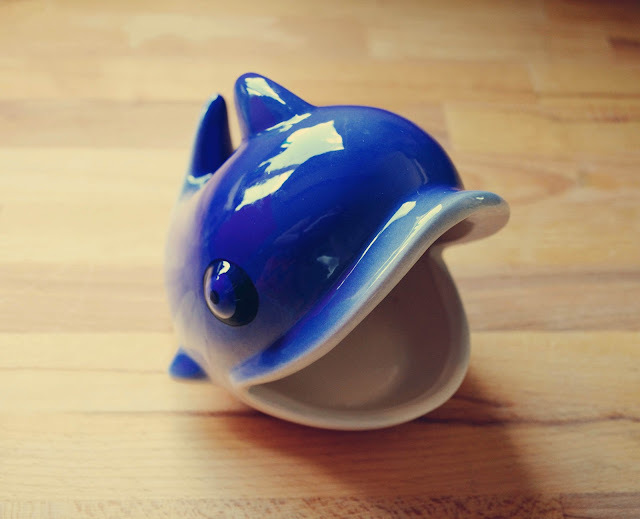 This little guy is going to bring me some cheer when I do dishes. He originally came from the dollar store (for $1.50) but I picked him up for 50 cents. The annual summer book sale was in full swing at the local library. While I certainly don't seek out VHS cassette tapes, I like the nostalgia of throwing a movie in the VCR at the cottage. 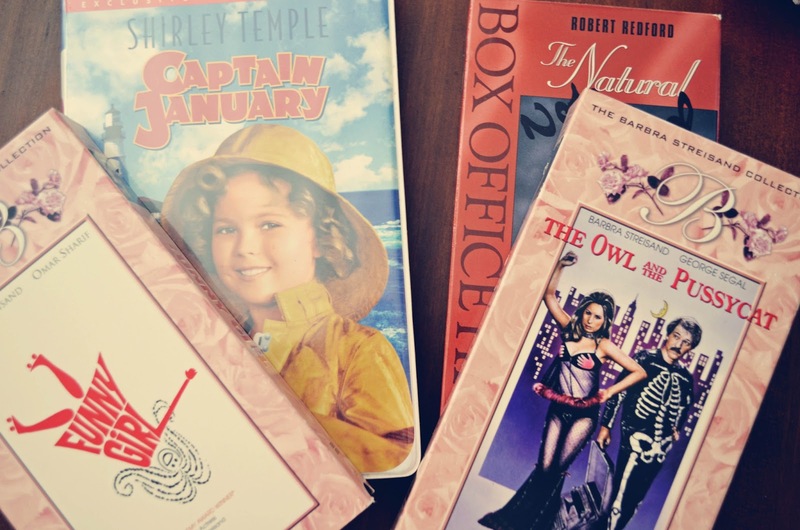 We picked up a Shirley Temple flick for my daughter, as well as some classic films for me: "Funny Girl," "The Natural" and "The Owl and The Pussycat." I need another book like I need a hole in my head, but I picked up a few tempting Canadian books. 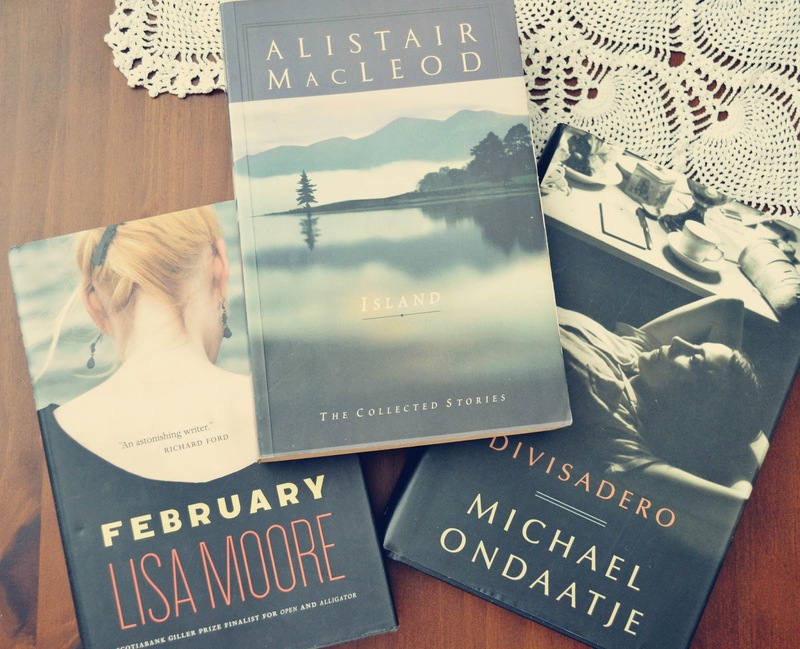 I haven't read any Lisa Moore novels yet and I'm looking forward to "February," winner of the CBC's annual book debate called "Canada Reads." It's the story of one woman's grief and struggle to cope after the death of her husband in the Ocean Ranger disaster - the oil rig went down off the coast of Newfoundland in 1982 with 84 crew members on board. I also picked up "Divisadero" by Michael Ondaatje and "Island," a collection of stories by Alistair MacLeod. I don't often read short stories, but I'm drawn to this book because these stories are set in one of my favourite places in the world, Cape Breton Island, where my parents grew up. 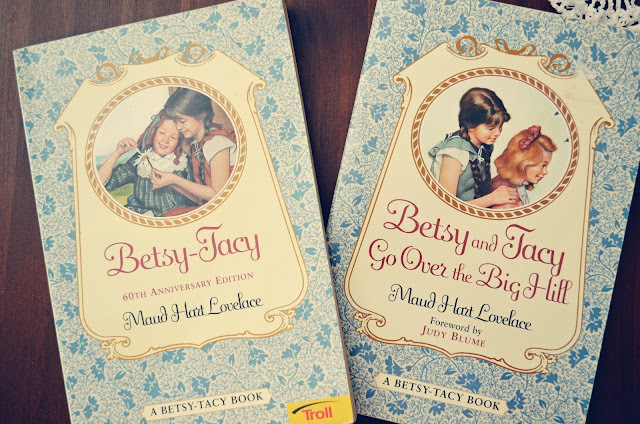 Many of you told me that you liked the "Betsy-Tacy" books as a child. My daughter happened to show these to me at the library. I figured it was meant to be. Hopefully we will carve out some time to read them together. 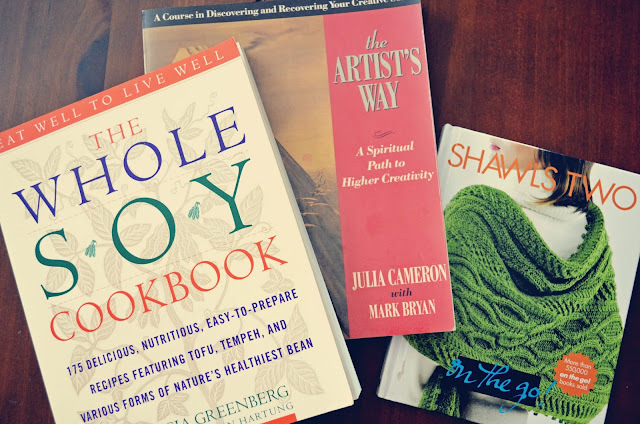 I picked up a few general interest books, "The Whole Soy Cookbook," "Shawls Two" and "The Artist's Way." I heard how great that last one was many years ago, but have yet to read it. I'm looking forward to finding "a spiritual path to higher creativity." 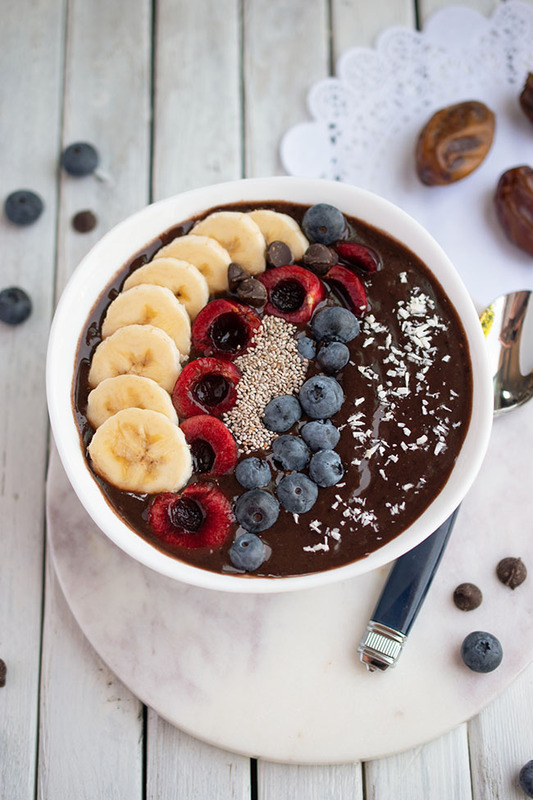 How do you get your shopping fix without spending a lot of money? The soap dish is great! I've also determined not to buy any more stuff unless it's absolutely useful, but an eBay parcel of a vintage set of bowls has just arrived and I have lots already... I tell myself "they'll be on display and actually used when the new kitchen is built". Truthfully, I have a habit. I read "February", it was just ok, not what I had hoped, I got through it though! Adorei o prato para doces! Love your finds, as always! And yay for those movies-- too awesome!! I just "shopped" my parents house while I was home, ha! I learned from the best- you ;) I am a horrible book collector also, and I have a hard time parting with books. Love that little whale!! I try to limit how much I spend. The operative word being "try". :) Usually though, just seeing all the stuff that is out there is enough for me! I am looking forward to the "World's longest Garage Sale" here in a few weeks! The ultimate test of restraint! You did find some lovely things and were very restrained! Love the books and the one's for your daughter look good also! I'm going to add Lisa Moore to my authors to check out! Thanks for sharing at TTF this week! 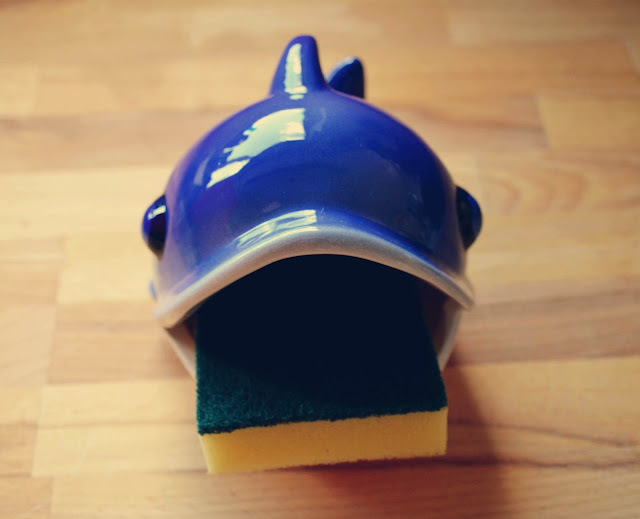 I love the wale and that you keep your sponge inside his mouth. So cute!